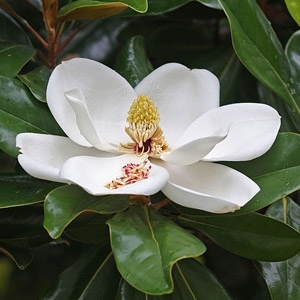 Magnificent flowering trees featuring fragrant, large white blossoms. Few trees can match it for year-round beauty. Leaves are shiny green, reddish underneath. Protect from winter winds and sun in northern areas. Evergreen. We carry Teddy Bear, Little Gem, Bracken's Brown Beauty & other varieties.